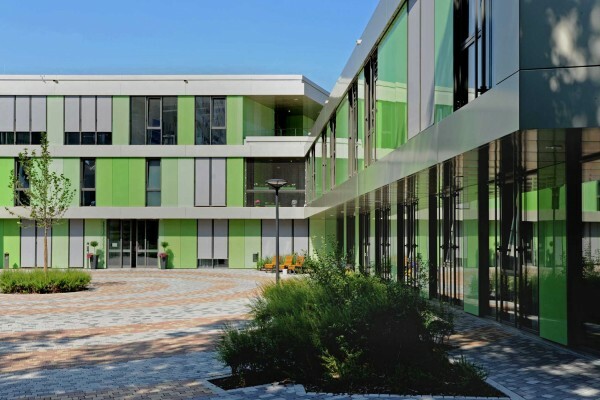 The new building of the Mental Health Centre at the location Groß-Umstadt offers on the ground floor space for service, social areas and areas for storage and building services. On the upper floors the patient rooms and treatment rooms are arranged. 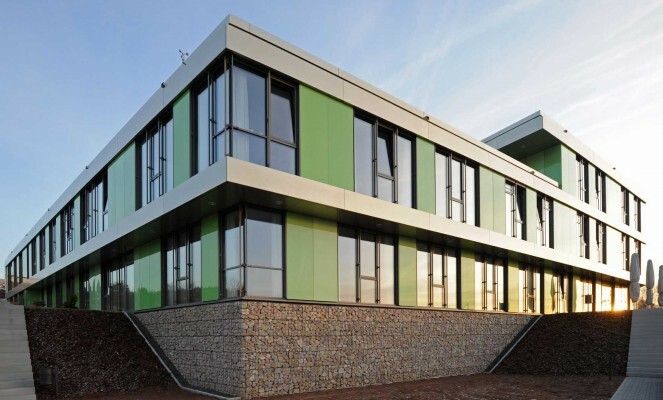 The 3-storey new building is located on a hillside on the western edge of the hospital premises. The storey development follows the south to north sloping terrain which results in a staggering of the stories. The ground floor and the 2nd floor extend only about 2/3 of the footprint. Approximately 50% of the ground floor is located within the hillside. The L-shaped building has an overall perimeter length of about 170 m and a depth of approximately 16 m to max. 32 m. Internal circulation takes place by 3 cores and a double lift.